Exclusive manufacturer and distributor of US Pod Box. Call for details and ordering. You can buy 1 or 1,000! Hafer uses top quality materials in manufacturing cases. A variety of wall materials and thicknesses are available to give the level of protection needed. When ABS plastic case walls are not enough for the job, we can go with the ultimate custom aluminum cases. Hafer Case designs and manufactures top-of-the-line custom cases for industry and endusers. Hafer craftsmen have 30 years experience in perfecting the proverbial bullet proof case, while elevating case making to an art form. Although Hafer Case has grown to serve clients and diverse industries across the United States, customers still receive one on one, first-class personal attention and service. When you phone Hafer Case, a real person takes your call and answers your questions. Hafer's knowledgeable representatives are ready to help with case designs, make recommendations, get quotes out as quickly as possible, and write your custom orders. Mobile businesses and professionals who ship, transport and carry business and mission critical equipment understand the true value of Hafer-made manufactured cases. Downtime and lost revenue due to damaged instruments and gear can be dramatically reduced or eliminated in Hafer cases fitted with custom foam inserts. Ordering Hafer cases means that you never have to compromise or accept a case that will just make-do. You get exactly what you need. Case interiors fitted with Hafer's protective foam case inserts with custom-machined compartments, virtually minimize or restrict movement and shock for case contents during transport and rough handling. These are only a few reasons to own Hafer cases. Call Hafer Case now to get started! Hafer uses top quality materials in manufacturing cases. A variety of wall materials and thicknesses are available to give the level of protection needed. When ABS plastic case walls are not enough for the job, we can go with the ultimate custom aluminum cases. Yes! 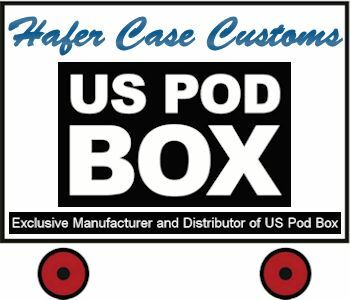 US Pod Box is now exclusively manufactured and distributed under the Hafer Case umbrella. 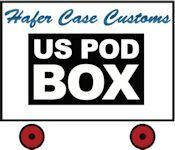 US Pod Box customers now order products directly from Hafer Case at 281-341-5070 or 800-990-8860. What is US Pod Box? US POD BOX™, now headquartered at Hafer Case, Inc. in the Houston, TX area, is the original and sole U.S. provider of rugged, mobile case units for efficiently transporting supplies and service capabilities for a diversity of professional applications. Pod Boxes are multi-application tools for fulfilling the needs of medical and emergency responders, disaster relief personnel, multi-media presenters, and all mobile professionals who are required to transport equipment, capabilities and services to customers and event locations. Pod Box cases are extremely durable and rugged, and dependent on purpose can feature multiple drawers, multi-layer lid organizers, cleanable work surfaces, edge casters and heavy-duty extendable handles. These cases are also used for sports medicine, mobile workstations, portable bars and serving carts and much more. US Pod Box products are manufactured using first quality construction materials and are built to provide years of service. US Pod Boxes exceed ATA 300 Transit case shipping requirements and are tested to meet Military Standard 810 C/D transit case specifications. US Pod Boxes are proven with a 50-plus year history of producing unique and serviceable case designs. Every US Pod Box unit is made in the USA by American craftsmen. For more information on how Hafer Case can customize your POD BOX to your mission, contact sales@hafercase.com, or call 281-341-5070 to speak with a sales representative.